Prime minister Mark Rutte has made it clear that the right-wing Liberal VVD will not govern with the anti-Islam PVV after the general election. ‘The chance is not 0.1%, but zero,’ Rutte told tv current affairs show Buitenhof on Sunday. All the other main parties had already categorically ruled out an alliance with the PVV, as had several senior VVD members. Opinion polls indicate the PVV may emerge as the biggest party after the March general election and would therefore take the lead in putting together a new coalition. 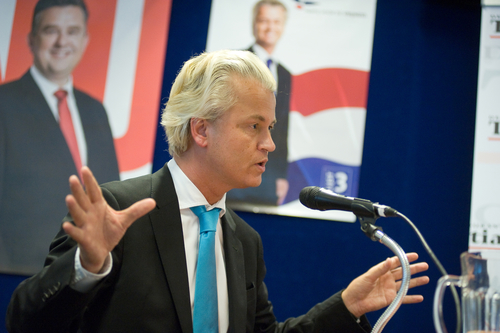 Geert Wilders immediately went on the offensive against ‘the arrogance of power’ on Sunday. He called on his voters to show what they feel ‘of this policy of exclusion and castigation’ on March 15’. The VVD’s position towards the PVV has been a subject of internal discussion for years, the Volkskrant pointed out on Monday. Rutte said after Wilders’ ‘fewer Moroccans’ chant in March 2014 that cooperation with him was impossible as long as the PVV leader did not withdraw the remarks. Health minister Edith Schippers has said she felt it was unwise to exclude parties automatically and VVD stalwart Hans Wiegel said in a column in De Telegraaf on Saturday that he was not in favour of boycotting the PVV. Rutte gave three reasons for his decision: the breakdown of the cooperation between the parties during Rutte’s first government, the PVV’s socio-economic course (‘further to the left than SP’) and principled objections to statements made by Wilders regarding Moroccans and the judiciary. ‘That does not mean that we exclude the PVV’s voters,’ said Rutte. ‘There are many people who feel that politicians no longer represent them, who are very concerned about the country. The people who vote for the PVV are decent people. I want to talk to them, I want to show that Wilders is not the leader to solve the problems’. The Volkskrant points out that by expressly excluding the PVV, Rutte has been able to head off sustained accusations from the PvdA and GroenLinks in particular that he is creating the possibility of a government with Wilders.